But let us look at the creeping, thin-stemmed dwarf bush or shrub of the cranberry. The Estonian name, jõhvikas, horsehair berry, comes from the thin "horsehair“ stalk that joins the berry to the stem. In the first year of growth the stems are herbaceous, in the second they become woody and begin to flake like the older branches of other shrub species. Cranberry leaves are evergreen, stiff and glossy, and less than a centimetre long. The berries generally ripen in mid-September; that is the sensible time to begin picking valuable and wholesome cranberries. Berries picked earlier and left to ripen remain less tasty and their beneficial properties are poor. Berries that have had repeated night frosts taste better but the keeping properties are not as good any longer. 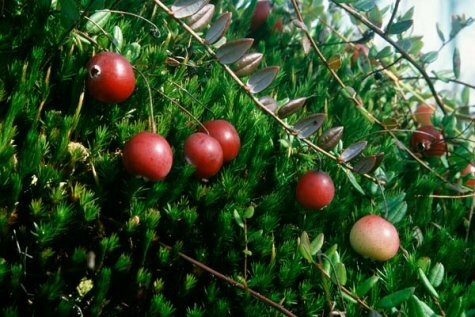 Among mammals foxes, raccoon dogs, badgers and of course bears know to appreciate cranberries. During the autumn fattening-up period cranberries are a source of vitamins, as well as in early spring after wintering or hibernation. In a "cranberry year“ up to a tonne of berries per hectare ripen in a good site.